Rebecca Kiss/Photography Editor A partially new group looks to carry on Binghamton women’s lacrosse’s success from last season. 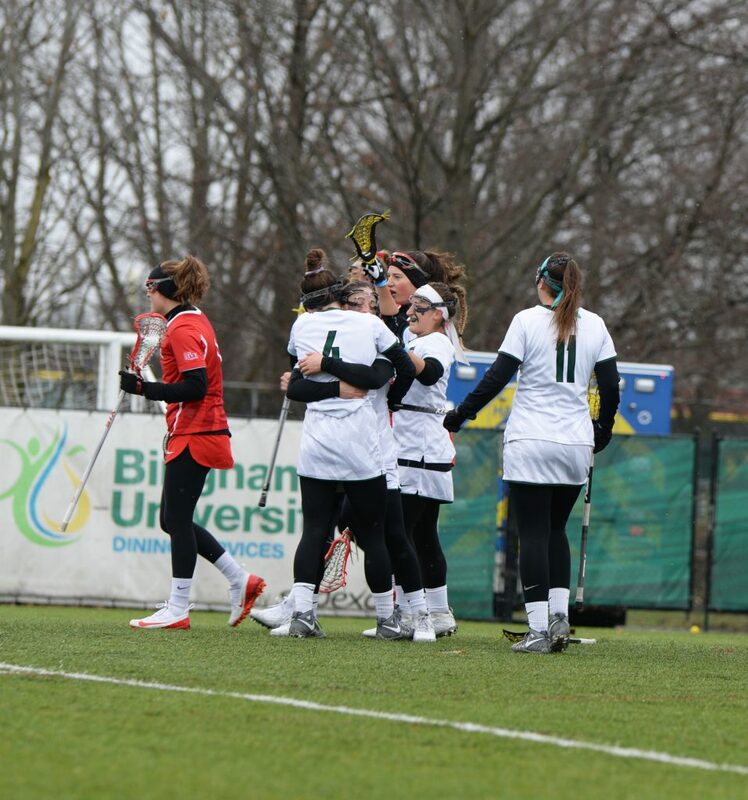 Following the finest campaign in its Division I history, the Binghamton women’s lacrosse team is laced with high expectations and is ready to hit the field for its 2019 campaign. Last season was special for the Bearcats. The team went 5-2 in conference play and reached the America East (AE) tournament for the first time in school history. After being picked third in the preseason poll this season, the team will look to carry over last year’s success with a new look group. After last year’s historic run, Binghamton has undergone a great deal of change during the offseason. The team graduated 11 players, including three of its top five scorers. Several Bearcat standouts have moved on from the program, including Jacqueline Kennedy and Brianne Arthur, ’18, ushering in a new era of Binghamton women’s lacrosse. Three Second Team All-Conference selections from last season return: senior midfielder Rebecca Golderman, junior defender Alexa Franze and junior goalie Taylor Passuello. Golderman is expected to lead the team in her final season as a Bearcat. She has had an illustrious career, being named AE Rookie of the Year as a freshman and First Team All-Conference in a sophomore season that featured a then-program record 44 goals. Sophomore attacker Paige Volkmann was named to the AE All-Rookie Team last season after logging 20 goals in her first year with the team. On the defensive side, two Second Team All-Conference selections return to anchor Binghamton’s backline. Franze leads the group of defenders following a breakout sophomore season, finishing second on the team in ground balls and caused turnovers. Passuello enters the season as the top goaltender. After last year’s senior class departed, Passuello, Golderman, senior midfielder Olivia Batista and senior defender Kaia Gallop were named new captains last fall. In women’s lacrosse, the AE has long been dominated by Stony Brook. The Seawolves have captured six straight conference championships and are ranked No. 5 in the national preseason poll. In light of knocking out BU in the AE semifinals last season, Albany was selected No. 2 in the conference preseason poll. Before facing off against their AE opponents, the Bearcats will open their 2019 schedule with a challenging nonconference matchup against No. 13 Syracuse. First face-off is set for 6 p.m. on Tuesday, Feb. 12 from the Carrier Dome in Syracuse, New York.